Ximenia americana or X. cafra. 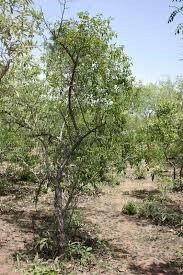 This drought-resistant, mostly solitary tree grows at low altitudes in a wide range of habitats including, savannahs, dry woodlands, dry forests, and along coastal areas or on river banks. It has a wide geographical distribution throughout many countries in Africa, Central and South America, as well as Australasia. The tree is found in woodlands and grasslands and on rocky outcrops and sometimes on termites mounds. It occurs from Tanzania in the north to KwaZulu-Natal in the south. In South Africa the two varieties have a different distribution pattern with var. caffra occurring in the northern and central regions of Limpopo and var. natalensis is found further east and south in Mpumalanga, Limpopo and KwaZulu-Natal. The genus Ximenia (Olacaceae) consists of eight species of small trees and thorny shrubs (Uiras, 1999) of which two occur in Southern Africa. 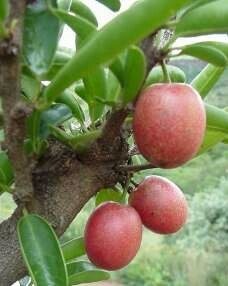 Ximenia americana L. (sour plum) is a thorny bush-forming shrub or small tree that can grow up to 7 m high. In South Africa the Red List Status is “Protected”. Ximenia oil is beneficial because of its content of saturated and monounsaturated fatty acids (about 99%), which make it, stable to oxidation and experiments have shown that the oil is useful for dry skin prone to early senescence and it is helpful to improve the functionary of the sebaceous tissues. Apart from that it also contains unsaturated fatty acids and has an exceptional nutritional value to nourish the skin while moisturizing, softening and revitalizing the skin. The yield of oil from the seed is high and has applied as an emollient, conditioner, skin softener, body and hair oil as well as included as an ingredient in lipsticks and lubricants. In addition, it is used in soap manufacturing and as a vegetable butter. It can be included in moisturising lotion and the ximenynic acid rich formulation is said to have beneficial effects on skin ageing amongst others. 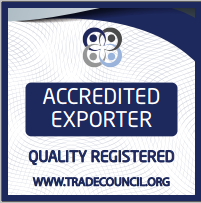 The characteristics has been thoroughly documented and published by I Vermaak from Tshwane University of Technology. The publication appeared in the South African Journal of Botany with title: African seed oils of commercial importance — Cosmetic applications is well worth reading. Analysis of the seed oil revealed: that the major components were oleic, hexacos-17-enoic (ximenic), linoleic, linolenic and stearic acids together with smaller quantities of triacont-21-enoic (lumequic), octadec11-en-9-ynoic (ximenynic), arachidonic, erucic, and nervonic acids shown to be beneficial upon topical application. Fatty acids with more than 22 carbon atoms, termed very long chain fatty acids, are rarely found naturally. Ximenia oil contains very long chain fatty acids with up to 40 carbon atoms. Scientific studies on the biological activities of the seed oil are not available. However, Studies on ximenynic acid have revealed improvement in blood circulation. Blood perfusion was increased in a group of female volunteers (n=40) applying a cream containing 0.5% ximenynic acid. The greatest effect of 50% increase was seen after 60 min especially on cellulitic areas were blood perfusion is usually very low (Indena). The kernels are extracted from the seed husks by means of a mechanical decorticator which removes the hard, outer husk. The kernels are then sieved out for pressing. The kernels are pressed without decortication. The kernels are pressed out by means of screw presses. These presses can be operated manually or driven by electric motors. The large scale potential of wild harvesting of Ximenia products such as seed and fresh fruit lends itself to job creation and poverty alleviation projects. In many of the high density areas, much of the fruit goes to waste every year. 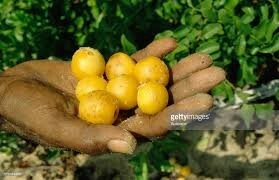 These can be picked up and sold to producers of pulp and oil and valuable income can be generated. The other great potential is to introduce superior selected trees for planting orchards with the aim to farm it as a crop. Potential for entrepreneurs are to start plant nurseries where selected superior plant material can be grafted onto small trees and these are then sold to farmers. Mander, M. 1998. Marketing of indigenous medicinal plants in South Africa: a case study in KwaZulu-Natal. Food and Agriculture Organization of the United Nations, Rome. Twine, W. 2004. Medicinal bark harvesting and yields in woodlands: a case study from southern Maputaland. In: M.J. Lawes, H.A.C. Eeley, C.M. Shackleton and B.G.S. Geach (eds. ), Indigenous Forests and Woodlands in South Africa: Policy, People and Practice (pp. 533-537), University of Natal Press, Pietermaritzburg. Raimondo, D., van Staden, L., Foden, W., Victor, J.E., Helme, N.A., Turner, R.C., Kamundi, D.A. and Manyama, P.A. 2009. Red List of South African Plants. Strelitzia 25. South African National Biodiversity Institute, Pretoria.